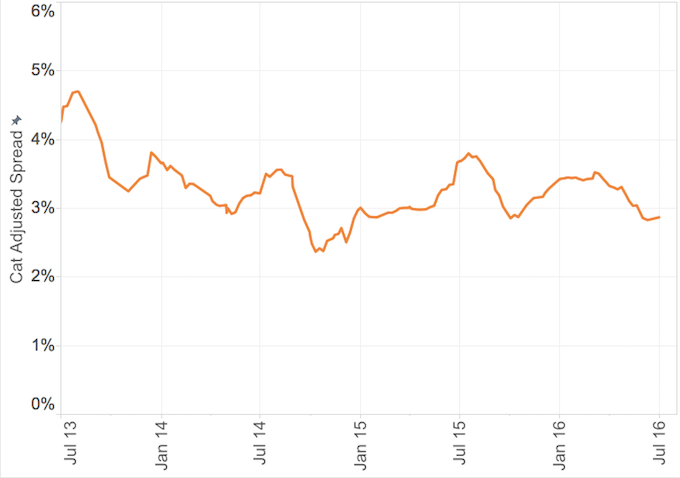 Rate reductions have continued over the last 12 months, but the rate of rate reductions has also continued to reduce. Four charts illustrate current pricing levels and how this is affecting reinsurance and ILS returns. 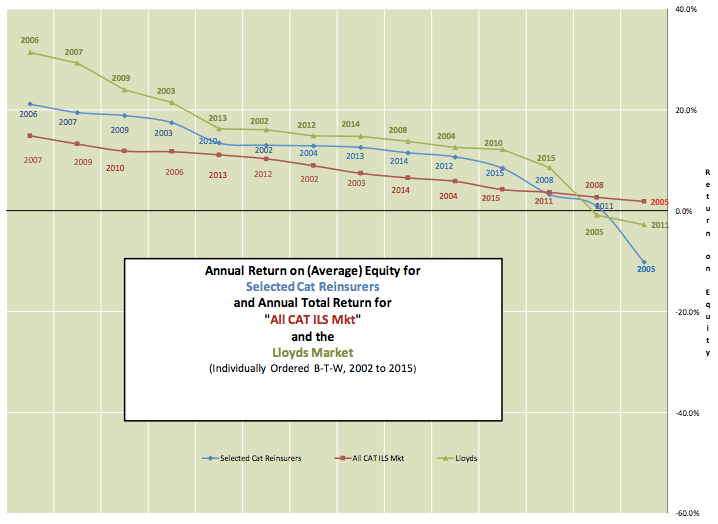 This chart from Lane Financial, shows the effect of the declining rate environment on returns. 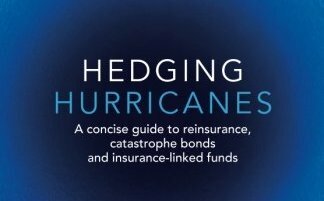 Despite the relatively benign loss environment, only major loss years produced lower returns than 2015: 2005 (Hurricanes Katrina, Rita and Wilma), 2008 (Hurricnaes Ike and Gustav) and 2011 (Japan and New Zealand earthquakes). The chart also highlights the effect of leverage on the Lloyd's and ILS markets. After the industry loss warranties market contracted in the two prior years, it bounced back and, following a surge in activity in the second quarter of 2015, overall limit purchased increased by more than 20 percent. To date in 2016, ILW year-over-year pricing reductions were between approximately 2.5 percent and 5 percent. 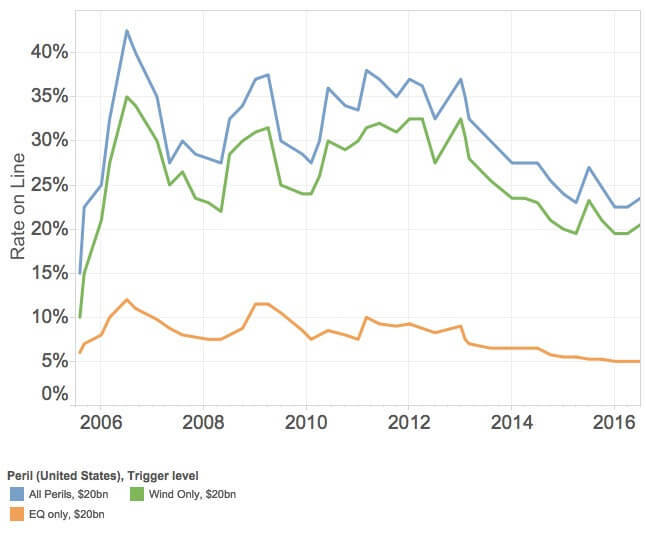 Since mid-May significant US and Florida Wind ILW limits have been traded and pricing has tightened, although not to the same extent as it did in the same period last year. Users who have registered (for free) can see the all the data here. 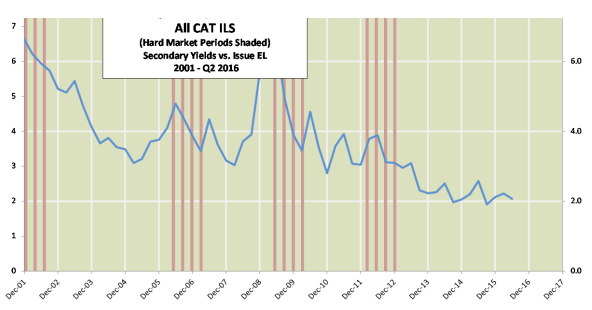 Risk-adjusted cat bond yields are also at multi-year lows for this time of year. Users who have registered (for free) can see the all the data here. Another chart from Lane Financial takes a longer view and shows that the mid year yield/expected loss multiple for cat bonds is at a 15 year low.